After breakfast take sightseeing tour of historic city visiting Old Delhi visiting the majestic Red Fort, a marvel in red sandstone, Jama Masjid, the largest mosque in India, both built by emperor Shah Jahan of Taj Mahal fame, Rajghat - memorial of Mahatma Gandhi & a Rickshaw ride past through the silver street in Chandani Chowk, the city tour continues covering New Delhi, visiting Rashtrapati Bhawan, one-time imperial residence of the British viceroys; the India Gate, a memorial raised in honour of the Indian soldiers martyred during the Afghan war; the Laxmi Narayan Temple, built by the Birlas, one of India's leading industrial families; Humayun's Tomb, lotus shaped Bhai's Temple , Qutub Minar , built by Qutub-ud-din Aibek of the Slave Dynasty; in the evening you can visit see speculative Light and Sound Show at Red Fort. Overnight at hotel. After breakfast, depart for Agra en route visit the Sikandra, mausoleum of Emperor Akbar built in 1492, The Tomb is combination of Muslims and Hindu Architectural styles. After visit continue to drive to Agra, on arrival transfer to hotel. After lunch you visit to witness incomparable Taj Mahal with its' speculative view. Taj Mahal, the architectural modern day wonder of the world; this monument is a fine example of the fusion of many architectural styles is one of the wonders of the modern world. Taj, endowed it with some of the loveliest buildings in the world. The tour continues with a visit to the Agra Fort from where one can get the most moving view of the Taj from the little octagonal tower in the Agra Fort which lies across the river Jamuna, followed by visit to Pearl Mosque and the Tomb of Itamad-ud-Daula built by Empress Noorjehan in memory of her father. In the evening you may visit to the souvenirs market of Agra, one should visit Oswal Emporium where they have built a Mini Taj Mahal inside their showroom and it took 10 years for the artists to complete the mini replica of the Taj. The show room conducts free sound & light show showing the eras of Taj Mahal. overnight at hotel. After a leisurely breakfast, visit the majestic Amber Fort, is one that cannot be easily described. Ride up on Elephants to the former capital of the royals set against the backdrop of the wooded hills. Later visit the Palace of Winds also known as Hawa mahal, this elaborate building, now little more than a façade, is encrusted with delicate screen sand carved balconies from which the royal ladies, confined to their quarters, could sneak views of the outside world. Past, present and future merge at Jai Singh's observatory, where time has been accurately measured since the 17th century. 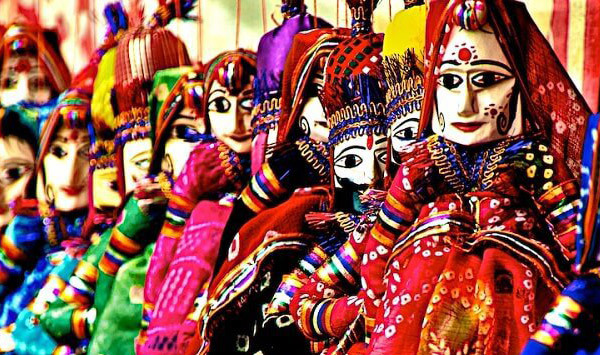 Evening enjoy dinner at Chokhi dani (an ethnic village resort) where you will have an idea of the village life of Rajasthan here you will also enjoy various traditional Rajasthani dances, puppet show and various other interesting activities. Overnight at hotel. Morning walking tour of some interesting streets and squares of the Pink City to catch glimpses of the habitual patterns of its people, which even includes attending heart-rending prayers at Sri Govind Devji temple. Optional day tour to Sanganer town (for block printing factories) or a lunch at Samode Palace. Sunset view of Jaipur from the imposing Nahargarh fort. Overnight at hotel. Morning drive to Ranthambhore- famous for the wildlife sanctuary which is said to have the India's friendliest Tigers and also considered to be the best place in the world to photograph the tiger in its natural habitat. Arrive Ranthambhore & transfer to hotel. Afternoon 3 hrs Jungle safaris in a Canter (a vehicle which is open on the top) enjoy the game viewing in the national park. Overnight at hotel. Early morning Jungle safari in National Park, Later drive to Bundi & transfer to hotel. Later in the day enjoy visiting Bundi, a charming little historic Rajasthani town having everything - impressive fort, beautiful palaces and exotic colorful bazaars - minus all the tourist hype. Bundi is still a virgin tourist spot. The town still seems living in medieval ages and nothing seems to have changed in the past many years. Morning at leisure, in time transfer to airport to board the flight for Delhi, At Delhi meet and assistance in time transfer to International airport for your flight back to home.